Model CAUA vertical (upflow) split system can provide efficient heating, cooling and/or makeup air, with heating sizes ranging from 150 to 400 MBH and cooling capacities of 5 to 15 tons. Air flow volume can range between 1,600 to 6,580 cfm. The unit can be fueled by either natural gas or propane. It can be arranged for power-venting or separated combustion. A cased cooling coil is available with either a 1/3 – 2/3 or a 50/50 split circuitry. 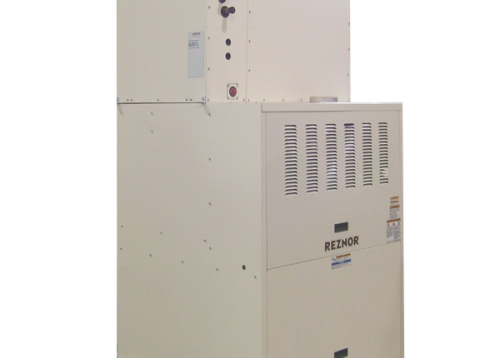 The 1/3 – 2/3 circuitry is compatible with the Reznor MASA condensing unit. These units provide a conditioned environment using return and/or outside supply air. With the addition of the optional makeup air burner (Options AD4), Model CAUA can allow for up to 100% outside supply air. An optional mixing box can be installed on the rear of the unit to provide outside and return air dampers with controls including an economizer. The top of the unit has a discharge opening with flanged duct connection. A screened discharge air plenum can be added for 2, 3 or 4 side air discharge. A high air velocity discharge plenum is available for use with cased cooling coil. Model CAUA can be installed in a mechanical room or closet where conventional horizontal systems may not fit. Most sizes will easily fit through a 3’ doorway. The larger sizes will fit through double doors. A single unit can be used for retail or light commercial applications instead of “twinned” residential units. Conversely, when the optional screened inlet base is coupled with the discharge air plenum, Model CAUA can be floor mounted in a large space and used and an effective air turnover (destratification) system. The standard direct drive motor assembly is capable of handling up to 1” w.c. of external static pressure on all sizes. An optional belt drive motor is capable of handling up to 1.5” w.c. of external static pressure on sizes 150 and 200, and 2” WC on sizes 250-400.
circuit board monitors heater operation and indicates normal operation as well as identifying any abnormalities in the control functions. As a separated-combustion unit, combustion air is drawn from the outdoors and vented to the outdoors by using an approved vent/combustion air intake concentric adapter kit. As a power-vented unit, air for combustion is taken from the space where the heater is installed and vented outside using an optional vent cap. Model CAUA Series units have a five (5)-year limited warranty against defective operating components and a ten (10)-year limited warranty on the heat exchanger. This equipment is design-certified by the Canadian Standards Association (CSA) for installation in the U.S. and Canada. *IF the heater is being installed as a separated-combustion power-vented unit, selection of either a horizontal or vertical concentric adapter combustion air/vent kit is required. Or, IF the heater is being installed as a power-vent only unit, a vent cap is required. Adjusted pressure drop is external ductwork plus any specified options.